I have to laugh because this is what friends of mine used to tell their kid whenever those familiar strains wafted within earshot on a hot summer’s day. I’m not sure if they then dragged their child indoors so she wouldn’t see everyone else in the neighbourhood lining up for popsicles and ice cream sandwiches, but I get it. Sometimes the truck’s timing is all off. You’ve just had a snack, or you already caved in to one of your kid’s demands. One thing’s for sure though: I pity the parent with an empty wallet when Dickie Dee makes his rounds. 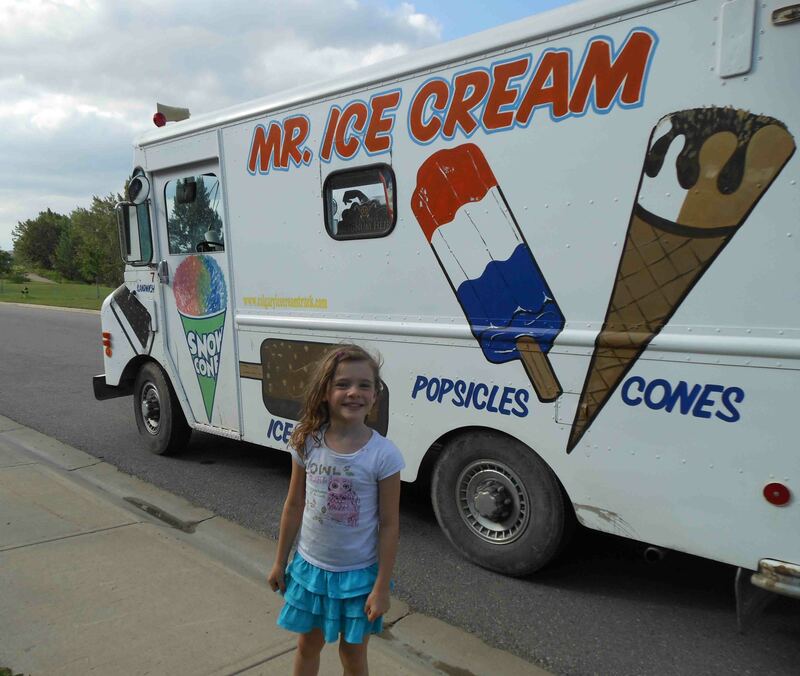 I love that Mr. Ice Cream (a Dickie Dee competitor, no doubt) features a bomb pop on the side of his truck. 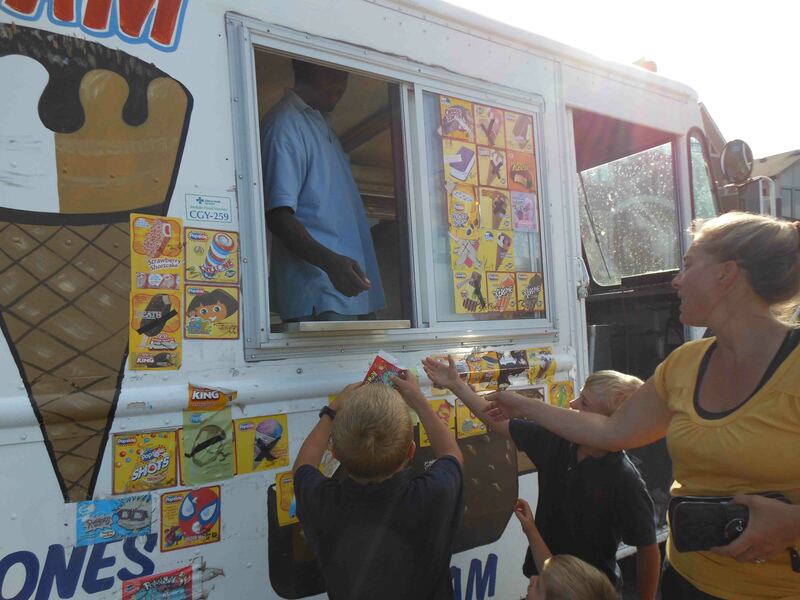 Now that Avery and Bennett are older (read: can eat ice cream without wearing half the cone) I actually welcome visits from the truck. It reminds me of when I was a kid and we’d hear that music coming up our street. Every child in the nighbourhood would sprint from their yard for a treat. 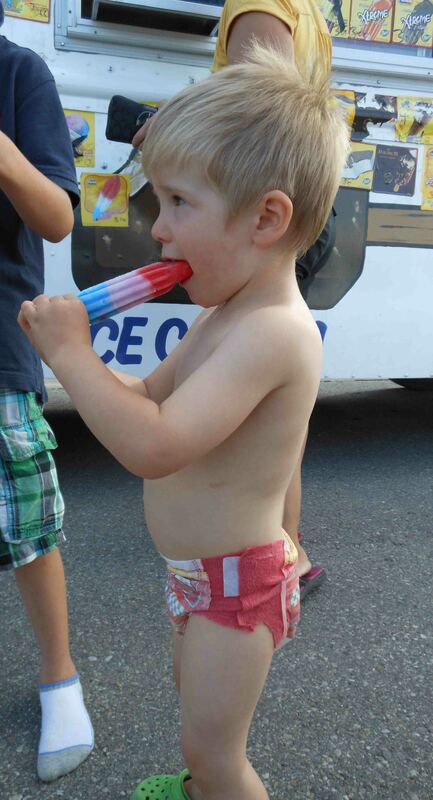 My favourite was a bomb pop popsicle, which I’m happy to see is still in rotation. Heeding the urgent call of Mr. Ice Cream, our neighbour greets the truck in his pull-up. So, we were delighted when a truck drove down our cul-de-sac street earlier this summer. It was a 1976 flashback, with kids, parents and adults running from all directions. We queued up, ordered, paid and then got down to sweet, drippy business. Awesome! Now, here’s my advice for the last week of summer vacation: When you hear those musical notes go find Dickie Dee — he still has lots of ice cream left. This entry was posted in Potpourri and tagged Dickie Dee ice cream, ice cream truck, ice cream trucks in Calgary, Mr. Ice Cream. Bookmark the permalink.